Action from the West Sussex West Schools Cross Country Championships. The West Sussex West Schools Cross Country Championships took place last Wednesday at Bishop Luffa school and it was the hosts who dominated the event by recording a clean sweep of both individual and team titles. 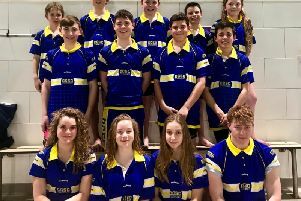 In cold but dry conditions, all four races were of a high standard with many of the competitors certain to feature strongly in the main Sussex schools championships at Waterhall, Brighton in January with an eye on selection for the English schools event later in the season. Proceedings at Bishop Luffa started with the junior girls race dominated by the school’s Buckler twins with Isobel on this occasion coming out on top 11 seconds in front of Eva. Cerys Dickinson from St Philip Howard picked up the third place medals in front of Midhurst Rother pairing of Tilly Russell-Stoneham and Tamsin Anelay who insured second team spot in front of Bishop Luffa whose third scorer was Amelie McGurk in ninth. In the junior boys race, runners from three different schools were at the front of proceedings with Luffa’s Harvey McGuiness just getting the better of Fionn O’Murchu from St Philip Howard after a titanic battle for most of the race. Hal Edgar did well to beat the rest in third place and led Midhurst Rother to third team spot behind St Philip Howard and winners Bishop Luffa with Gabryel White in fourth and Max Sydenham sixth making up their scoring team. In the senior and intermediate combined girls race the top six to finish overall comprised the top three in each age group. Newcomer to the Sussex schools scene, Ellie Farrow was a clear winner of the senior race and first overall followed by Alice Cox-Rusbridge and Alice Ward, a clean sweep for the hosts. In the intermediate race, Olivia Toms made a valiant effort to chase Farrow for much of the race and did well to finish second over the line followed by Maggie King in fourth and Charlotte Bullard in fifth, with Chichester High School pupil Bullard preventing another Bishop Luffa clean sweep. The senior and intermediate boys race started off at a furious pace with Bishop Luffa seniors Leo Stallard determined to make it a true test of stamina. The pair ran within a few strides of each other until the start of the final lap when Stallard gradually increased the pace and in the end had nearly 20 seconds to spare over Potter. Behind them was an equally fine battle for the top intermediate spot with Luffa’s James Gardam just getting the better of Ethan Ward from Felpham by a mere two seconds after nearly 14 minutes of running. In fifth overall was Harry Sage, another newcomer to the event claiming the individual senior third place for Bishop Luffa while Archie Sadler from Midhurst Rother was third intermediate to finish in 10th place overall. With three runners in the top five, Bishop Luffa won the senior team race with the lowest score of the day, a mere eight points, and it was left to Douglas Smith in 11th and Joseph Clines 13th to ensure a clean sweep for the hosts.